72 pages plates, diagrams and index. small octavo (7 3/4" x 5 1/2") issued in stiff boards with black cloth spine and black lettering to cover. Annotations by Emanuel Lasker. (Betts: 27-36) First edition. 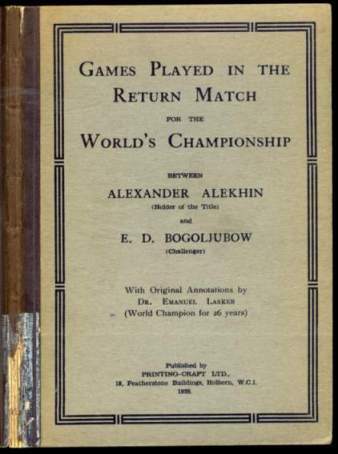 Contains introductory matter on the organization and significance of the match, the 26 games, annotated, career records of both players, and index of openings and portrait photographs. Spine ends 2" chipped away, corners bumped. A good to very good copy.